Rhizobium sp. strain TAL1145 catabolizes mimosine, which is a toxic non-protein amino acid present in Leucaena leucocephala (leucaena). The objective of this investigation was to study the biochemical and catalytic properties of the enzyme encoded by midD, one of the TAL1145 genes involved in mimosine degradation. The midD-encoded enzyme, MidD, was expressed in Escherichia coli, purified and used for biochemical and catalytic studies using mimosine as the substrate. The reaction products in the enzyme assay were analyzed by HPLC and mass spectrometry. MidD has a molecular mass of ~45 kDa and its catalytic activity was found to be optimal at 37 °C and pH 8.5. The major product formed in the reaction had the same retention time as that of synthetic 3-hydroxy-4-pyridone (3H4P). It was confirmed to be 3H4P by MS/MS analysis of the HPLC-purified product. The K m, V max and K cat of MidD were 1.27 × 10−4 mol, 4.96 × 10−5 mol s−1 mg−1, and 2,256.05 s−1, respectively. Although MidD has sequence similarities with aminotransferases, it is not an aminotransferase because it does not require a keto acid as the co-substrate in the degradation reaction. It is a pyridoxal-5′-phosphate (PLP)-dependent enzyme and the addition of 50 μM hydroxylamine completely inhibited the reaction. However, the supplementation of the reaction with 0.1 μM PLP restored the catalytic activity of MidD in the reaction containing 50 μM hydroxylamine. 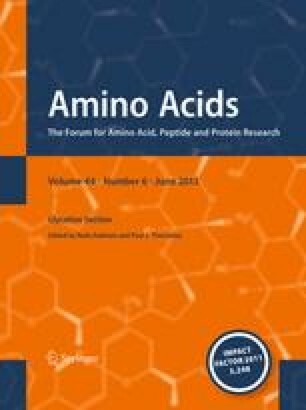 The catalytic activity of MidD was found to be specific to mimosine, and the presence of its structural analogs including l-tyrosine, l-tryptophan and l-phenylalanine did not show any competitive inhibition. In addition to 3H4P, we also identified pyruvate and ammonia as other degradation products in equimolar quantities of the substrate used. The degradation of mimosine into a ring compound, 3H4P with the release of ammonia indicates that MidD of Rhizobium sp. strain TAL1145 is a C–N lyase. The online version of this article (doi: 10.1007/s00726-013-1479-z) contains supplementary material, which is available to authorized users. We are thankful to Prof. E. J. Behrman (Dept. of Chemistry and Biochemistry, Ohio State University) for providing us the synthetic 3H4P. This research was supported by the National Science Foundation Award No. CBET 08-27057 and partially by a HATCH grant (CRIS 0216234). VSN was supported by IFP fellowship from the Ford Foundation for three years.